The moon is returning to the evening sky, and that is sad news for those seeking Comet Hartley. If you have a clear western horizon – tonight and tomorrow night – you can see the waxing crescent moon and the star Antares appear rather low in the southwest sky after sunset this Sunday evening. They are low in the southwest for us at mid-northern latitudes. Look for Antares, the brightest star in the constellation Scorpius, to the east (upper left) of the moon. Catch the two luminaries at nightfall, before they follow the sun beneath the horizon. 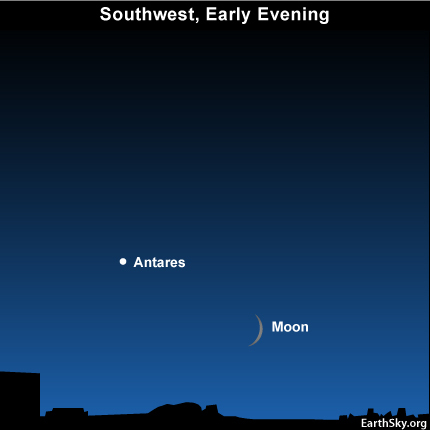 People in the southern hemisphere see Antares more directly above the moon. Moreover, the moon and Antares stay out much later after dark in the southern skies. If you are unsure whether you are looking at Antares, try binoculars. 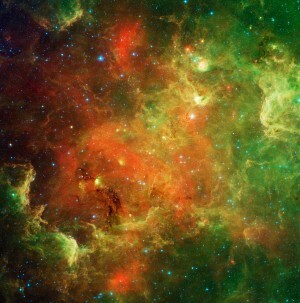 Binoculars bring out the star’s distinctive color. Its ruddy complexion indicates a cool surface temperature and reveals that this star is well into the autumn of its years. People are amazed that the sun has some 1,300,000 times the volume of the Earth. But that’s nothing. Antares is a red supergiant star, hundreds of millions of times more voluminous than our sun! If Antares replaced the sun in our Solar System, we would be sitting inside this star, and the star’s diameter would span some 6 times the sun/Earth distance. After sunset on October 10 and October 11: the crescent moon and Antares in the southeast sky.